The exhibition was held in the Rare Books Exhibition space, Sir Louis Matheson Library, Monash University from 19 October 2000 - 28 February 2001. 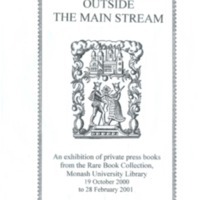 All rare book collections have holdings of limited-edition, private press books. Here at Monash University we have a long-standing interest in this field. The "History of the Book" has always been one of our areas of teaching and research. We have our Centre for the Book, and we also have the Ancora Press where hand-printing is carried on under the tutelage of Dr. Brian McMullin. Dr. McMullin has chosen widely from the items in the Rare Book Collection to demonstrate the beauty of type-faces, and the role of book design in private press publishing.